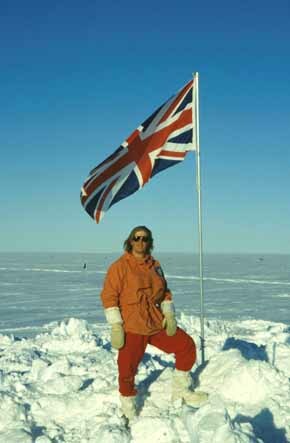 Graeme Hart in the Antarctic - What Is A Field Trip? Otherwise known as Jollies, these were one of the major bonuses of living in the Antarctic. As you will see from the pictures, even Halley had some beautiful scenery, despite being a flat ice shelf. Each season we were allowed to go on two field trips - one 7 day trip before mid winter and a 10 day trip after. Four people would go on a trip together, one of whom was the base GA (someone who knew what he was doing and made sure we didn't injure ourselves too badly). Since everyone wanted to go when it was sunny, we had to draw lots to get a time window in which to go. Consequently, some people ended up going on a 7 day holiday in a blow, only leaving the tent for nature's necessities. The party would take two tents. Each person travelled on a skidoo, towing in a sledge, so a field party broke down into two self contained teams of two. These teams travel together and usually everyone went out exploring together.